The stunning scenery and simple design philosophy of Scandinavia is the inspiration behind our new Natur Roman blinds and curtains collection. We hope it inspires you to create a room that’s warm, welcoming and effortlessly contemporary. This geometric Roman blind fabric from Natur, our Scandi range is inspired by Scandinavian design aesthetics. It adds a touch of contemporary style to this simple bathroom. Get the scandi look with these beautiful floral motif curtains in shades of on-trend teal and buttercup yellow. For an added layer of cosiness, not to mention a pop of sunshine colour, we've teamed our Freyja Mustard curtains with a Lotta Citron Roman blind. Scandi fans will totally love this look. The pink eyelet curtains are a subdued touch, carefully accenting the décor without blowing the subtleties of this cool, Scand-themed room. See how the eyelet header creates deep pleats, adding height to the window too. Geometric designs are in style, and this one from Natur, our Scandi collection is no exception. Use alone at the window to make a statement, or combine with matching scatter cushions. Citron-coloured curtains are a fab way to add some zing to a living room. Here, the neutral shades and natural textures get a real lift thanks to the simple addition of these gorgeous curtains. The Tetbury range features statement and neutral plains. We’ve teamed this coral shade with curtains from Natur – our Scandi collection. The striking graphic design of Freyja Flint from our Natur collection, our range inspired by the Scandinavian design aesthetic, features a stylish washed out colour scheme. Bold blooms make it the perfect partner to a contemporary or Scandi scheme. Effortless Scandi style is everywhere at the moment, and Natur, our range inspired by Scandinavian design draws on this. This stylish fabric offers a subtle wash of colour in a chalky design. This lovely, understated curtain is the perfect foil for the bright and bold features in this lounge. Greys and whites feel homely here thanks to all the textures involved. The curtain at the door is a great idea for winter, helping keep the warm air in and the cold out. See how the Roman blind adds something different too. Grey is such a strong colour right now. Here, the grey blackout curtains and roman blinds look so cool teamed with the blacks and whites in this home office. This is a look with lots more depth than a simple monochrome finish. This is lovely, understated curtain is the perfect foil for the features in this lounge. The rich blue really makes this plain pencil pleat curtain standout – it’s definitely the eye-catching feature in this modern home office. The pencil pleat header helps to relax the feel, while the simple fabric balances the geometric pattern in the blind it’s layered with. This is lovely, understated curtain is the perfect foil for the bright and bold features in this lounge. Get the Scandi look with the Natur collection of Roman blinds and curtains. Choose from stripes, geometric prints and bold patterns, in soft shades of dove grey, mineral blue and coral, with complementary bold accents for a lively addition to the reflective colour palette. 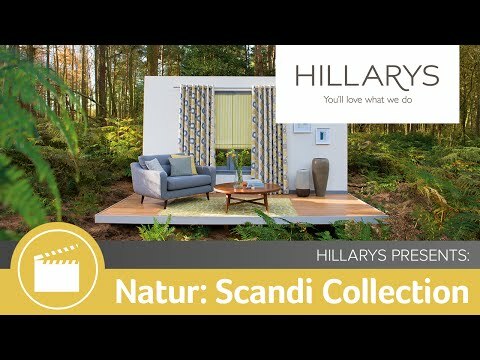 As you would expect from Hillarys, Roman blinds and curtains from the Natur range come fully lined as standard, with options for thermal linings on Roman blinds and curtains, and tie-backs and custom pleats on curtains in the collection. Coordinating cushion covers are also available to complete the Scandi look. And don’t forget to ask your in-home advisor to show you our Visualisation tool, where you can see just how the fabrics from the Natur range will look in your home. Scandi style is all about creating warm and happy homes. We’re sure you’ll love living with Natur. We've given the Lorraine studio a style makeover with gorgeous blinds and accessories from the Natur Collection. Tune in to Lorraine every weekday to see our Freyja Mineral Roman blind and sofa cushions covered in a selection of fabrics from the range.